On the 1st of May AS L (2015), the Peerage of the Order of Defence was created in the Society of Creative Anachronism. On Saturday the 2nd of May AS L at May Crown in the Barony of Ildhafn, the Crown concurrently elevated the first three members of the peerage in Lochac: Master Caleb Adolphus, Master Damian Greybeard and Master William de Cameron. Sir Seosamh an Cruca O Maille from the East Kingdom gave up his personal badge for use of all members of the Order across the Known Worlde. Said badge is: Three rapiers in pall inverted tips crossed (tinctureless). The badge is protected under all tinctures. Master Caleb’s Order of Defence badge, cast by Sir Leofric Willoughby de Broke. Photo by THL Ceara Shionnach, May 2015. Upon their initiation into the Order, a member receives a number of items of regalia. The items of regalia given to the first three Companions of the Order of Defence were a fealty chain, a white livery collar, and a badge of the Order. Master Caleb opted for a leather livery collar including the SF badge and brass ends, and was presented with a fealty chain from Kinggiyadai Khagan. 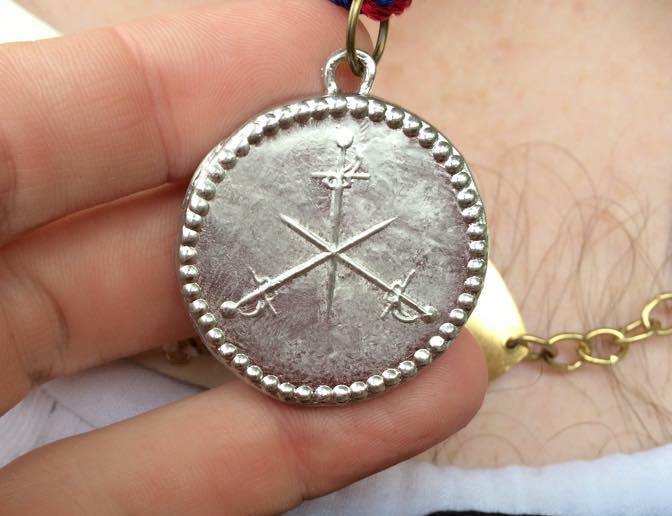 Master Caleb’s livery collar. Photo by THL Ceara Shionnach, May 2015. 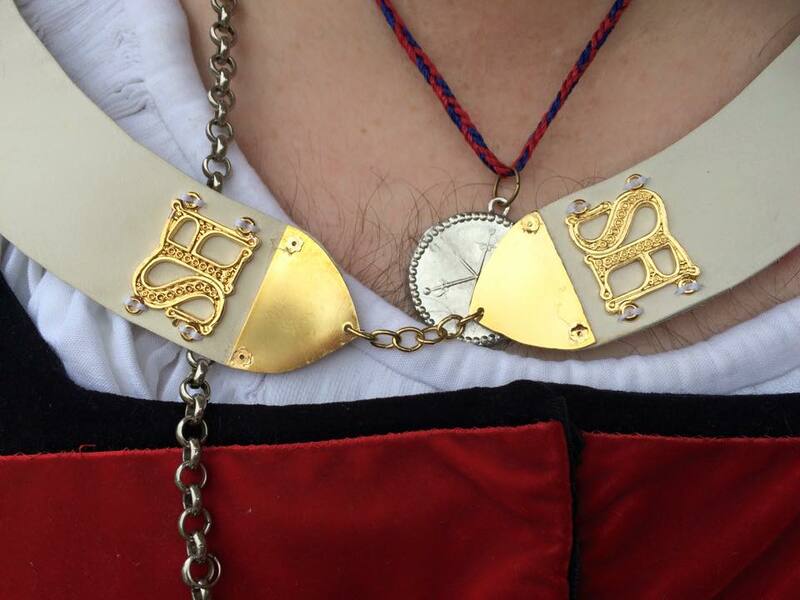 Master William opted for a leather livery collar including the SF badge and brass ends and to continue wearing his Pelican fealty chain. Master Damian opted for a leather liverly collar with brass ends and without the SF badge, and was gifted Sir Wolfram Flammenherz’s knighting chain for fealty. During the creation of this Peerage in Lochac, members of other Peerages and Polling Orders were invited to speak. Sir Steffan Glaube spoke on behalf of the Chivalry, proclaiming that this was a good day for the Kingdom, and for the SCA. Master Tariq ibn Jelal spoke proudly on behalf of the Laurels, reduced to tears of joy at the occasion. Master Bernard Stirling spoke on behalf of the Pelicans and The Honourable Baron Emrys Tudor spoke on behalf of Lochac’s Company of Archers. Finally and poetically, the newest Don Ludwig von Regensberg spoke on behalf of the Order of the White Scarf of Lochac. The first three members of the Order swore an oath of perpetual fealty on the Sword of State. They were also dubbed thrice with a sword – Master Caleb (by Kinggiyadai Khagan) and Master William (by Altani Yeke Khatun) on the Lochac Sword of State, and Master Damian (by Kinggiyadai Khagan) on his personal steel rapier. Lochac’s inaugral Masters of the Order of Defence swearing a fealty oath on the Lochac Sword of State. Photo by THL Ceara Shionnach, May 2015. Kinggiyadai Khagan gave each of the first a buffet – the final sombering blow they were to receive that would go unanswered. Then, Altani Yeke Khatun gave each a kiss on the opposite cheek, to remind them of the pleasures that accompany their elevation. 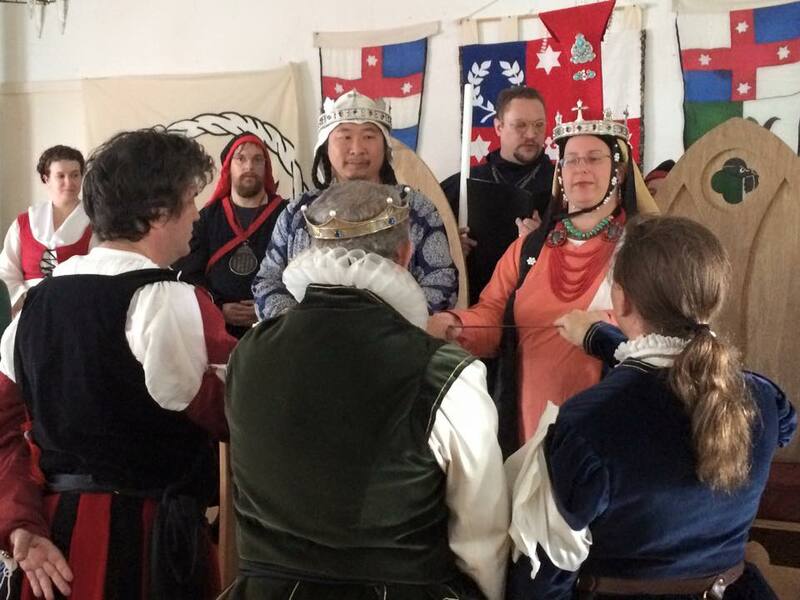 These inaugral members were also invited by the Crown to marshal Lochac’s May Crown Tournament.